The information in text can be generally divided into two categories: objective information and subjective information. Objective information encompasses the facts about something or someone, while subjective information is about someone's personal experiences. For example, the fact that it is raining is objective, while how one feels about the rain is subjective; that you have not had breakfast is objective, while your feeling of hunger is subjective; that you watched “You Can Count on Me” last night is objective, while your emotion of heartwarming because of the movie is subjective. Subjective information about what people think and how people feel is useful for all parties including individuals, businesses, and government agencies during their decision-making processes. The traditional way of collecting subjective information takes the form of surveys, questionnaires, polls, focus groups, interviews, etc. For example, individuals ask their friends which cell phone carriers they recommend and whether the coverage is good in their area; retailers conduct a focus group to have in-depth discussions with their target customers about how they feel regarding shopping in the stores; governments solicit public opinions on particular policy issues via surveys. The web and social media have changed the way we communicate and provide new potentially powerful avenues for us to glean useful subjective information from user generated content such as blogs, forum posts, reviews, chats, and microblogs. However, much of the useful subjective information is buried in ever-growing user generated data, which makes it very difficult (if not impossible) to manually capture and process the information needed for various purposes. To address the information overload, it is essential to develop techniques to automatically discover and derive high-quality (i.e., contextually or application relevant and accurate) subjective information from user generated content. Current subjectivity and sentiment analysis efforts have been focused on classifying the text polarity, specifically, whether the expressed opinion for a specific topic in a given text (e.g., document, sentence, word/phrase) is positive, negative, or neutral. This narrow definition considers subjective information and sentiment as the same object, while other types of subjective information (e.g., emotion, intent, preference, expectation) are either not taken into account, or are handled similarly without sufficient differentiation. This limitation may prevent the exploitation of subjective information from reaching its full potential. At Kno.e.sis, we extend the definition of subjective information and develop a unified framework that captures the key components of diverse types of subjective information. We define a subjective experience as a quadruple (h, s, e, c), where h is an individual who holds the experiences, s is a stimulus (or target) that elicits the experiences, e.g., an entity or an event, e is a set of expressions that are used to describe the subjective experiences, e.g., the sentiment words/phrases or the opinion claims, and c is a classification or assessment that characterizes or measures the subjectivity. Accordingly, the problem of identifying different types of subjective information can all be formulated as a data mining task that aims to automatically derive the four components of the quadruple from text, as illustrated in Table 1. Table 1 Components of sentiment, opinion, emotion, intent, preference and expectation. Emotion an individual who holds the emotion An event or situation emotion words and phrases, description of events/situations anger, disgust, fear, happiness, sadness, surprise, etc. The traditional sentiment analysis would find positive opinion about action and science fiction movies, “Mad Max: Fury Road,” “Inside Out” and “Spy,” and find negative opinion about the movie “Jurassic World.” However, if we consider different types of subjective information, and handle each particular type based on the framework we proposed, we will be able to derive much richer information from the text, as illustrated in Table 2. Table 2 Information that can be extracted from the example text. Figure 1 depicts the process of subjective information extraction. At the beginning, a number of preprocessing steps are needed to handle the raw textual data before the information extraction can take place. Common preprocessing steps include sentence splitting, word tokenization, syntactic parsing or POS tagging, and stop words removal. Afterwards, an optional step is to detect the subjective content from the input text, such as classifying the sentences into subjective or objective categories. The subjective content can be further classified into different types, e.g., sentiment, emotion, intent and expectation. Language resources such as WordNet, Urban Dictionary, and subjectivity lexicons (e.g., MPQA, SentiWordNet) can be used for the subjectivity classification task. Figure 1 An overview of subjective information extraction. The next step is to extract the four components of subjective experiences, including the holder, the stimulus or target, the set of expressions, and the classification category or assessment score. Depending on the type of subjective information, specific techniques need to be developed and applied. For example, the target of sentiment is usually an entity, and thus entity recognition is used to extract sentiment target; while the target of intent can be an action, e.g., “to buy a new cell-phone”, thus we need to develop techniques to extract actions from text. 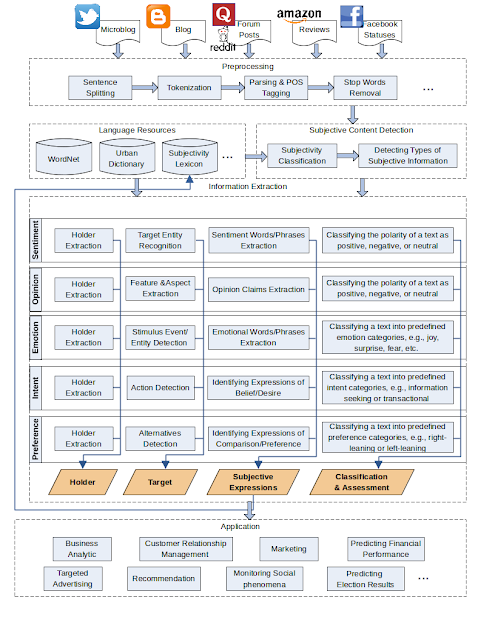 In addition, for the same type of subjective information, different classification/assessment schema and techniques may need to be developed according to the purpose of application. For example, many sentiment analysis and opinion mining systems classify the polarity of a text (e.g., a movie review, a tweet) as positive, negative or neutral [1-3], or rate it on a 1-5 stars rating scale [4,5]. Some emotion identification systems focus on classifying emotions into six basic categories: anger, disgust, fear, happiness, sadness, and surprise , while some other systems define their own set of emotions based on the application purpose, e.g., understanding emotions in suicide notes , identifying emotions that people express using cursing words , classifying emotional response to TV shows and movies . Existing work on detecting users' query intent classifies search queries into three categories: navigational, informational, or transactional [10,11]. Studies on identifying purchase intent (PI) for online advertising classify users' posts into PI or Non-PI , or information seeking or transactional . Finally, the extracted subjective information can be used for a wide variety of applications, including but not limited to business analytics, Customer Relationship anagement (CRM), marketing, predicting the financial performance of a company, targeting advertisement, recommendation (based on users' interest and preference), monitoring social phenomena (e.g., social tension, subjective well-being), and predicting election results. At Kno.e.sis, we have developed automatic methods to extract components of different subjective experiences. We have proposed an optimization-based approach that extracts a diverse set of sentiment-bearing expressions, including formal and slang words/phrases, for a given target from an unlabeled corpus . We have developed a clustering approach that identifies opinion targets (product features and aspects) from plain product reviews . 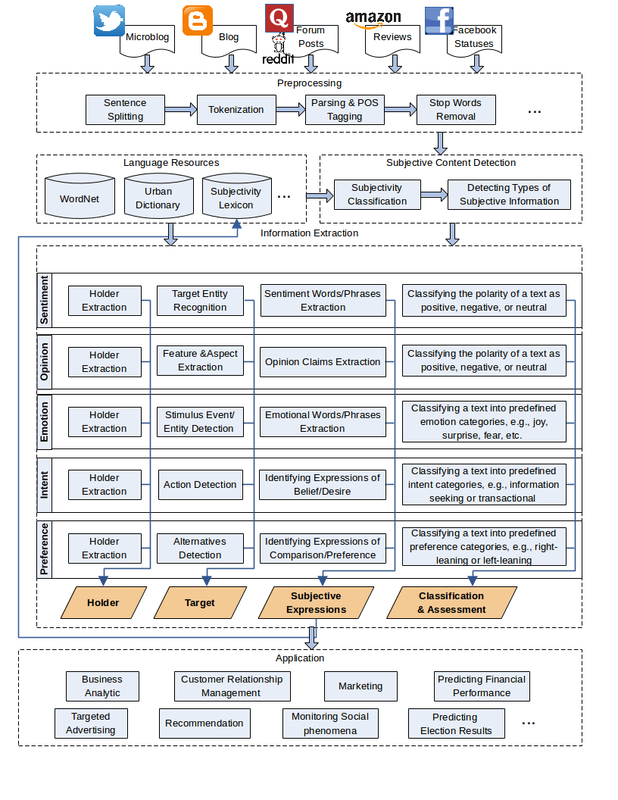 The proposed approach identifies features and clusters them into aspects simultaneously. Furthermore, it extracts both explicit and implicit features and does not require seed terms. We have also explored the classification and assessment of different types of subjective information. In particular, we have explored supervised methods for emotion classification [6-9]. We have proposed methods to group opinion holders based on their political preference and participation in the discussion about election candidates on Twitter, and assess their sentiments towards the candidates to predict the election results . In order to understand the effect of religiosity on happiness, we analyzed the tweets and networks of more than 250k U.S. Twitter users who self-declared their religious beliefs, and examined the pleasant/unpleasant emotional expressions in users' tweets to estimate their subjective well-being [16,17]. Pang, Bo, Lillian Lee, and Shivakumar Vaithyanathan. "Thumbs up? : sentiment classification using machine learning techniques." EMNLP. 2002. Lu Chen, Wenbo Wang, Meenakshi Nagarajan, Shaojun Wang, Amit Sheth. Extracting Diverse Sentiment Expressions with Target-dependent Polarity from Twitter. ICWSM. 2012. Cícero Nogueira dos Santos, and Maira Gatti. "Deep Convolutional Neural Networks for Sentiment Analysis of Short Texts." COLING. 2014. Ganu, Gayatree, Noemie Elhadad, and Amélie Marian. "Beyond the Stars: Improving Rating Predictions using Review Text Content." WebDB. Vol. 9. 2009. Sharma, Raksha, et al. "Adjective Intensity and Sentiment Analysis." EMNLP. 2015. Wenbo Wang, Lu Chen, Krishnaprasad Thirunarayan, Amit Sheth. Harnessing Twitter "Big Data" for Automatic Emotion Identification.SocialCom. 2012. Wenbo Wang, Lu Chen, Ming Tan, Shaojun Wang, Amit Sheth. Discovering Fine-grained Sentiment in Suicide Notes. Biomedical Informatics Insights (BII). 2012. Wenbo Wang, Lu Chen, Krishnaprasad Thirunarayan, Amit Sheth. Cursing in English on Twitter. CSCW. 2014. Justin Martineau, Lu Chen, Doreen Cheng and Amit Sheth. Active Learning with Efficient Feature Weighting Methods for Improving Data Quality and Classification Accuracy. ACL. 2014. Jansen, Bernard J., Danielle L. Booth, and Amanda Spink. "Determining the informational, navigational, and transactional intent of Web queries." Information Processing & Management 44.3: 1251-1266. 2008. Hu, Jian, et al. "Understanding user's query intent with wikipedia." Proceedings of the 18th international conference on World wide web. ACM, 2009. Gupta, Vineet, et al. "Identifying Purchase Intent from Social Posts." ICWSM. 2014. Nagarajan, Meenakshi, et al. "Monetizing user activity on social networks-challenges and experiences." Proceedings of the 2009 IEEE/WIC/ACM International Joint Conference on Web Intelligence and Intelligent Agent Technology-Volume 01. IEEE Computer Society, 2009. Lu Chen, Justin Martineau, Doreen Cheng and Amit Sheth. Clustering for Simultaneous Extraction of Aspects and Features from Reviews. NAACL. 2016. Lu Chen, Wenbo Wang, Amit Sheth. Are Twitter Users Equal in Predicting Elections? A Study of User Groups in Predicting 2012 U.S. Republican Presidential Primaries. Proceedings of the 4th International Conference on Social Informatics (SocInfo). 2012. Lu Chen, Ingmar Weber and Adam Okulicz-Kozaryn. U.S. Religious Landscape on Twitter. Proceedings of the 6th International Conference on Social Informatics (SocInfo), 2014. Lu Chen. “Mining and Analyzing Subjective Experiences in User Generated Content.” Ph.D. Dissertation. Department of Computer Science & Engineering. [Dayton]: Wright State University; 2016. p. 161.